Braided hairstyles are surprisingly numerous. The kinds of braids and the styles of plaiting really amaze. Braids look gorgeous on anyone who tries them, but for sure for naturally thick hair braids are the best hairstyles. No African American woman can help looking, loving and trying braids. It may be Dutch braids and French braids, fishtails and twists, and don't forget about box braids that are among the hottest styles of the season. For sure, you must already know many natural braided hairstyles, but as I have said braids are endless source of inspirations and new designs appear every now and then. Asymmetrical hairstyles are discussed all around, and indeed they are in the mainstream, but this doesn't mean that we should forget about symmetry. The perfect side parting and straight cornrows are meant for oval face shapes, yet it is quite simple, you decide yourself what braids you choose and which way they go. In this braided hairstyle you can see particular blending of African American braids with French braids. The small braids ending in bigger two French braids make a playful hairstyle that will seduce any man. For black women sometimes it appears difficult to fight with baby hair growing from all sides and naturally curly hair that can be out of control. 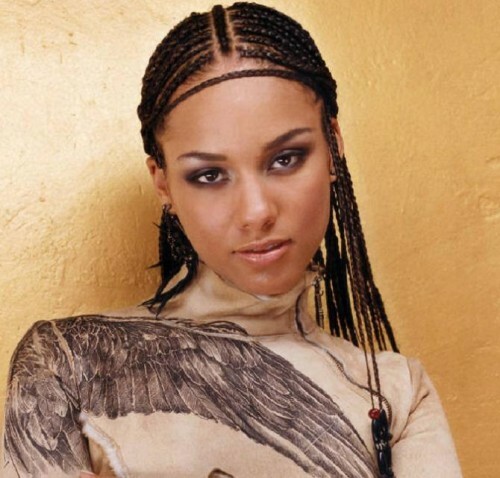 This hairstyle for black women with tight braids on side is a marvellous decision to the described problem.